← How to convert files of AutoCAD to pcl? The powerful document converter docPrint Document Converter Professional will help you resolve this problem because it can convert AutoCAD to sgi format file perfectly. There are three applications in docPrint Document Converter Professional which can be called docPrint Pro for short. They are GUI application, command line application and virtual printer which contains two pirnters—docPrint and docPrint PDF driver. The three applications can realize their functions respectively but more or less the same. 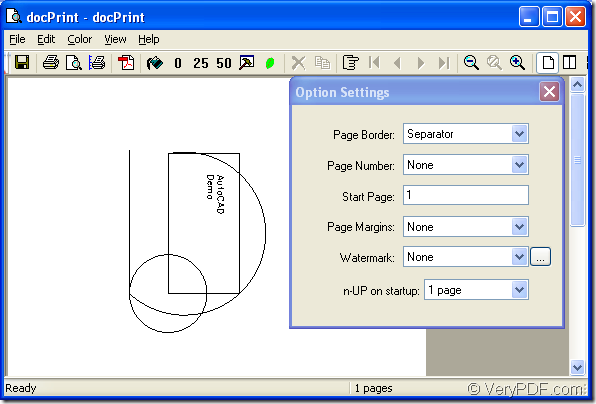 The application to be introduced in this article is the virtual printer docPirnt which is a Windows printer driver that saves ink, paper and time by controlling printed output, it supports print 2, 4, 6, 8 or 16 pages on a single sheet of paper, it also supports scale A0, A1, A2, A3 papers to standard Letter or A4 paper sizes. docPrint is also a Document Converter, it converts any printable document to 50+ graphics, it may be a Microsoft Word file, Adobe PDF file, HTML file, Excel file and others, docPrint supports various image formats, resolutions and compressions. docPrint is easy-to-use, just print a document to "docPrint", you will be able to start using Document Printer software. If you download docPrint Pro at http://www.verypdf.com/artprint/docprint_pro_setup.exe and install it in your computer, you can see two applications in installation folder, including GUI application and command line application. To browse docPrint, you should click “Start”—“Printers and Faxes” to open the printer list. If you have set docPrint as your default printer, there will be a small check shape above the printer. You can run the printer by open some kind of documents. Here you can see the example of converting AutoCAD to sgi. Please open the dwg document in your computer and click “File” and click “Plot” in the dropdown list to run the printer driver. 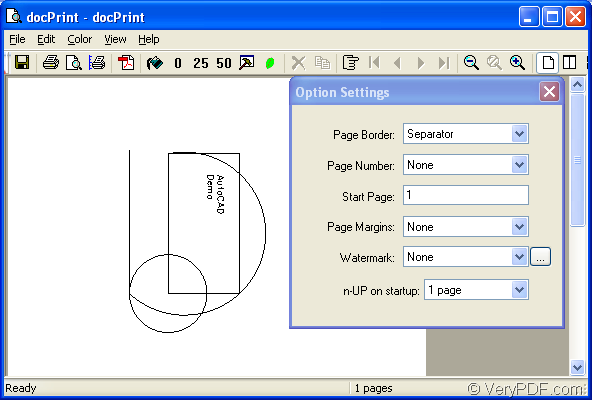 The opened dialog box called “Plot-Model” in which you should choose the current printer as “docPrint” in “Name” combo box and click “OK” button to close the dialog box and continue the work. Then you can see a new dialog box named “docPrint” in which you should try to open the next dialog box named “Save As” to save your target file and run the conversion. You can click “File” and click “Save as” in the dropdown list, or click the icon which likes a floppy disk, you can also press “Ctrl”+ “P” to do the same work. Please see Figure1. 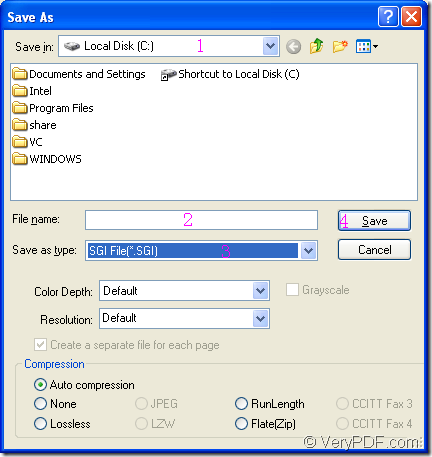 In the last dialog box of the conversion of AutoCAD to sgi, the “Save As” dialog, you should specify the location for the target file in “Save in” combo box, edit the name of the target file in “File name” edit box, choose the output format for the target file in “Save as type” combo box, then click “OK” button. Please see Figure2. After converting AutoCAD to sgi, you can open the target file with some image editor programs or image process programs such as the famous Photoshop, IrfanView, GSview and so on. If you want to read more articles about docPrint, you can visit the blog http://www.verypdf.com/wordpress/. How to print webpage to pcx? How to convert documents of MS Visio to ps? How can I convert a text file to PDF that contain Chinese Character and Hong Kong Font? How to print a CUR file to PDF file? Is PDF Stamp support transparent PNG image? How can I create high quality JNG from Word document?